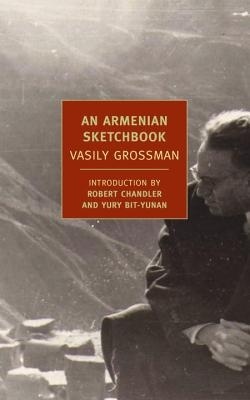 An Armenian Sketchbook, a travel memoir of sorts by the great Russian writer Vasily Grossman, is an example of a book that demands a bit of research before I write anything about it here. 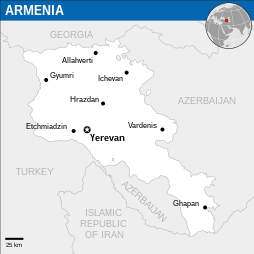 Before my research, I knew next to nothing about Armenia, not even its exact location. All I knew before reading the book had to do with the Armenian Genocide: i.e. from my reading of Louis de Bernières Birds without Wings I learned that early in the 20th century the Ottomans in Turkey had killed more than a million Armenians. I also knew that the Nobel Prize winning author Orhan Pamuk was recently prosecuted by authorities when he publicly acknowledged that this genocide had taken place because it is a criminal offence to do that in Turkey. (It seems so odd to me that Turkey, in other ways a shining light of Islamic democracy and moderation, should deny free speech in this extraordinary way. I can’t imagine how they think they can be admitted to the European Union for as long as they keep denying their bloody history. But presumably matters are more complex than they seem from far away in Australia, or they wouldn’t persist with their denials). So although there is a helpful introduction by Robert Chandler and Yuri Bit-Yunan in this edition, I have indeed done a bit of research in order to write this review. Wikipedia, of course, came to the rescue with the geography I needed. There it is at left, Armenia bordered by Turkey, Iran, Azerbaijan, and Georgia, which like Armenia was part of the USSR when Grossman wrote his book in 1962. According to Wikipedia, Soviet rule under Lenin was not too bad, compared to the Ottomans. Armenia was/is a poor country, so they welcomed food and medicine provided by the USSR, though the church suffered of course. Under Stalin there was repression, but because the Germans never reached Armenia in WW2, there were welcome developments in agriculture and industry. And repression was relaxed a bit under Khrushchev when he became the Soviet Union’s new leader after the death of Stalin. It was Grossman’s fate to underestimate the extent of the repression that continued. Yerevan, the capital, is the place where Grossman disembarked from the Moscow train, a long journey by any standards. Google tells me that today it’s a 34 hour drive, about 1780 km. Why is this relevant? Because Grossman wasn’t a travel writer, a Soviet version of H.V. Morton. He exiled himself to Armenia – a healthy distance from Moscow – because the Soviets had confiscated his masterpiece, Life and Fate and scornfully told him that it could not be published for two or three centuries. They objected because the central theme of this brilliant novel is that Nazism and Stalinism were as bad as each other. (See my review). Devastated, Grossman took on the job of translating and editing a soviet realist novel – about a smelter. (Yes, pardon the pun, it sounds riveting, doesn’t it? The Soviets loved ‘uplifting’ novels about the joys of working in factories. ) But Grossman needed the money, he needed to be away from Moscow, and he needed to restore his equanimity. We all introduced ourselves and sat down at the table. Aleksay, sensing my curiosity about him, frowned and for a moment seemed rather shy. But soon we were talking about matters that interested him more than anything else in the world – love for other people, right and wrong, good and evil, faith and lack of faith. And from his very first words, as I looked into his eyes and listened to his awkward, ungrammatical peasant speech, I felt what I had not once felt in the presence of the catholicos: I sensed that this was a man of faith. I sensed this not from anything he said but from a sure intuition. He was not trying to convince me of anything. He spoke with sorrow about people’s reluctance to follow life’s most important law – that you should wish for others what you wish for yourself; that you should wish good to others without exception, regardless of their nationality, of their wealth or poverty, of their faith or lack of faith, regardless of whether or not they are party members. If you don’t wish yourself harm, if you don’t do harm to yourself, then you shouldn’t wish or do harm to others. (pp. 93-94). When you think what evidence of man’s inhumanity to man that Grossman had witnessed as a war correspondent for the Red Star – his report The Hell of Treblinka was used as testimony for the Nuremberg Trials – it is not surprising that the main theme of this book is the nature of true goodness. The Russian title of An Armenian Sketchbook is Dobro vam which means Good to you – not a Russian expression but a literal translation of the Armenian greeting Barev dzez. It is a greeting perhaps closest in meaning to ‘all the best’ – which for some reason we tend to reserve for written expressions of goodwill. I think it’s a pity the book was renamed; the new title doesn’t convey the real intent of the author. This is a beautiful book, wise, amusing, interesting and inspiring. It is impossible to read it without some heartache for Grossman. He was in the early stages of cancer when he wrote it, and he died without ever seeing his ‘arrested’ novel in print. In Moscow, there is a poignant memorial to what they call their ‘hero cities’, the ones like Kiev, Stalingrad and St Petersburg which exemplified outstanding heroism. For me, Grossman is a hero of literature, and I hope one day that his statue will join those that I’ve seen of Russia’s other great authors – Tolstoy, Dostoyevsky, Chekhov and Pushkin. Update: I owe a thank you to Stu at Winston’s Dad for bringing my attention to this book, see his inspiring review here. Further update: Nancy at Silver Season has written a review of this book too; it’s well worth visiting to see. Sounds good. I’ve just finished ‘Life and Fate’ which I didn’t like at first but definitely grew on me. I have been wondering about his other works especially ‘The Road’ but this one also looks good. Thanks. I’m going to read everything he ever wrote. I’ve got The Road on my TBR. Yeah, it’s great when an author and his works has that effect on you, isn’t. I find it good to know, that as a reader, it can still happen. I find it happens more these days, I’m getting better at choosing what I read (and what I won’t waste my time on). Ah, I must get around to him! Yes, I think it’s really important for Australian writers to read authors like Grossman. We are so safe, here, and it’s so easy to forget that the rest of the world is not like that. Visiting Russia, which came so close to being defeated by the Nazis, was a real wake-up for me. If I ever wrote a novel, (as if!) it would inform my consciousness (as Grossman does) I am sure. (This is why I like your novel, because it recognises risk and danger). Great piece, Lisa. I’ll be going after this one for sure. Thanks, Patrick. There’s some great stuff coming from NYRB classics, a bit like our Text Classics, bringing back the best of the backlist. Great review, Lisa – it sounds like a very poignant read. It’s been on my radar for a little while, and I’m going to have to get hold of it. Thanks, Jacqui. I wish I could remember which of my blogging friends put me onto it, I owe them thanks! I’m sure I’ve seen one or two other reviews of this book, and I’m trying to think which of the bloggers I follow covered it – possibly Tony Malone and/or Stu, and it may have been sometime last year. I’ve found Stu’s, which was probably what alerted me to the book. Stu is responsible for most of the translated books that I have on my shelves! Thanks for writing about Grossman. I was introduced to him a couple of years ago and have read several of his books, but not this one yet. Life and Fate is a very rich novel. The action is centered on the defense of Stalingrad but it is also about life under the Stalinist regime and what it does to people’s integrity. Would I lie in order to survive? Probably. Thanks for this, I’ll put it on my list of books to get. I’ve really liked everything I’ve read of Grossman. In terms of Armenia, you might be interested in Werfel’s The Forty Days of Musa Dagh. That sounds like a must-read. I’ve put it on my wishlist at GoodReads and will get a copy on my next spending spree!